This tutorial only reviews uncooled thermal cameras, the most commonly used choice in surveillance. However, cooled imagers can see far farther but cost much more. See FLIR's uncooled vs cooled note for a overview of cooled thermal. 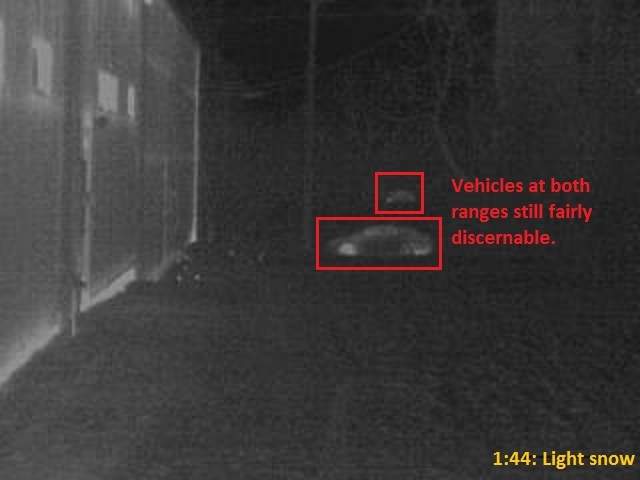 Since they do not see visible light, thermal cameras do not reproduce color, and fine details between areas or objects of similar temperature are lost. Compounding this, their lower resolution results in lower pixel density, further reducing detail. At close ranges, especially with VGA cameras, some details may be discernible, such as clothing types, or a known subject may be recognizable, but these are generally outlying cases, not the norm. Unlike visible light cameras, where the megapixel race continues, thermal camera resolution has remained fairly steady, with QVGA resolution, 320 x 240, still most common, though some sensor manufacturers offer a slightly higher resolution, 384x288. 640x480 resolution is the current maximum thermal commercially available, and increases cost greatly over 320 x 240 cameras. Previously, resolutions below QVGA were common, such as 160 x 120, but these are phasing out, with manufacturers discontinuing these models as higher resolution sensor costs come down. We highlighted the differences between QVGA and VGA cameras in our thermal resolution shootout. Unlike visible cameras, where CS mounts and varifocal lenses are ubiquitous, thermal cameras almost always use fixed focal length lenses. When selecting thermal cameras, one needs to carefully check and determine what lens length / FoV they want. Motorized zoom lenses are available, but are limited to high-end pan/tilt/zoom cameras, for example, and drastically increase unit cost. Thermal camera lenses are generally machined from germanium, as glass is not thermally transparent and actually blocks thermal cameras. This is one reason thermal camera price increases as lens size goes up, as larger pieces of germanium are more difficult to source and machine. Lens Length: Thermal imagers are frequently available from 90 degree to less than 10 degree Horizontal FoVs. Like all cameras, the narrower the FoV, the farther the camera can see (with a tighter coverage area). Resolution: Today, as noted above, two practical options are most common in surveillance (QVGA and VGA), though our tests did not show much distance benefits going from QVGA to VGA. Environmental conditions: Thermal is more robust than conventional cameras but can be undermined by certain environmental conditions. For instance, heavy snow or rain can reduce visibility as well as hot temperatures close to that of a human being. While available from most thermal camera providers, pan/tilt models are still relatively uncommon. Most often, movable thermal cameras consist of a fixed camera mounted on a pan/tilt positioner, using only digital zoom, due to the high price of thermal zoom lenses. Thermal speed dome cameras have started to become more common, with FLIR, DRS, and Bosch all offering models in this form factor. 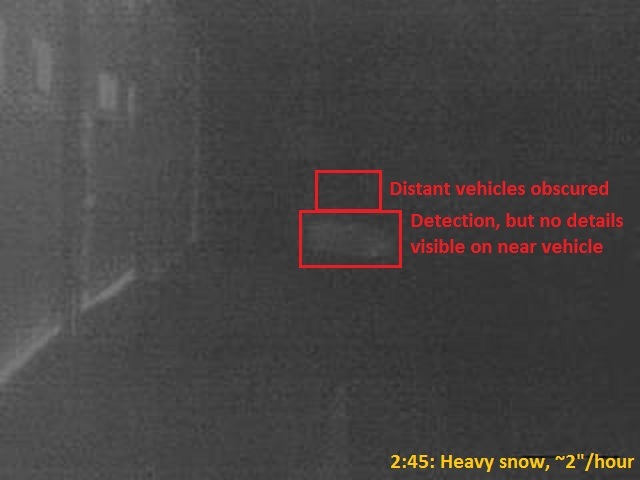 Digital zoom is perhaps more useful in thermal imaging than visible. Because the camera is only providing detection level video, often times at long ranges, a warm intruder may only be a few pixels on screen. The ability to digitally zoom the camera on this area of interest does not provide additional detail, but by simply enlarging the pixels, the subject may be easier to see. Because they provide a higher-contrast image in varying conditions, thermal cameras are often preferred for analytics. Especially in low light scenes, when a visible camera may produce heavy noise due to increased gain, thermal cameras can be more effective. Specifically, thermal eliminates shadows and headlights, two common problems for conventional cameras. However, thermal cameras may still be affected by moving tree branches and blowing leaves, two common challenges for analytics, as these objects still generate heat, changing the image as they move. Because of their ability to detect object temperature, thermal cameras may be used for specialized analytics which visible cameras cannot, alarming when temperatures exceed pre-set thresholds. Two examples of this are the FLIR A series, targeted at utility providers, and the Vumii EyeSec FD, which purports outdoor fire detection at ranges up to seven miles. Compared to visible cameras, there are only a small number of thermal camera providers. Fewer still offer cameras in VGA resolution, or pan/tilt versions, though these have become more common as time goes on. Likely the most common manufacturer is FLIR, who sold only thermal cameras until their recent acquisition of Lorex and Digimerge. Other common names such as Axis, Bosch, and Pelco offer multiple models, with specialist manufacturers such as DRS and Vumii mainly selling thermal cameras only. Thermal cameras are considerably more expensive than conventional cameras. The lowest cost thermal cameras available today have a street price around $2,000 USD, though these are outliers. Generally, users should expect to pay ~$5,000 USD for a 320x240 camera, and $9,000 or more for a VGA camera. High-end PTZ cameras cost well beyond this, from tens of thousands of dollars through six figures. While thermal prices have come down over the last decade, they have neither met the marketing claims of thermal manufacturers nor come close to eliminating the price gap. Strength: Imaging in low or no light conditions. Strength: Able to produce images in adverse conditions such as smoke and fog. Strength: Better detection ability than visible cameras at longer ranges. Weakness: Little to no detail in images. Weakness: Much more expensive than visible cameras. Weakness: Detection performance suffers in humid or hot environments.